It wasn’t until 15 years after the collapse of the Soviet Union that average incomes recovered to the late Soviet level, and when they had recovered the distribution was much less equal, such that the average income could be propped up by small numbers of super rich individuals. It is still the case today that many ordinary Russians are worse off economically than they were in the late Soviet period. Russians blame Yeltsin for this. By the time Yeltsin left office, his approval rating was frequently as low as 2%. By contrast, President Trump’s approval rating is presently around 42%–he’s 21 times more popular. The Russians regard the 90s as a dark, miserable decade in which their wealth was stolen by oligarchs. 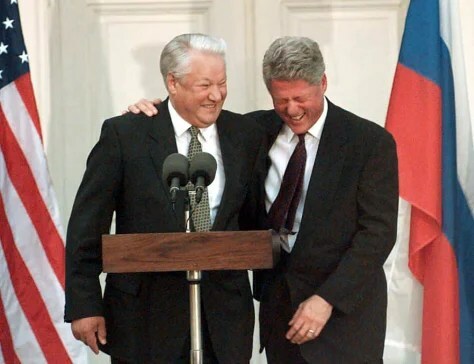 Yeltsin was America’s man, and America’s man was blamed for all of this. Today, when academics talk about the 90s in Russia, the discussion is about how poorly the transition away from communism was managed and how this mismanagement created the conditions which led to the rise of Putin–a super oligarch ruling over a harem of smaller fish. But it wasn’t just economic policy that went wrong in the 90s. The Russians see Clinton as having taken advantage of their famously drunk, inept leader on the world stage. In 1999, Clinton admitted Poland, Hungary, and the Czech Republic to NATO. The Russians see NATO as an anti-Russian military alliance. By admitting former Warsaw Pact members to NATO, Clinton assimilated countries which Russia considered to be in its sphere of influence into the western sphere. Beset by a collapsed economy and ineffective, incompetent leadership, Russia was in no position to meaningfully challenge NATO expansion in the 90s. So the Russians feel that during the decade in which their relationship with the Americans was warmest, they were economically robbed and brutalised on the world stage. Their experience of the 90s has taught them not to trust us, and they are extremely suspicious of everything we say and do. The effect is especially profound when you consider that we are still dealing with Vladimir Putin–Boris Yeltsin’s immediate successor, a man who defines himself politically entirely against Yeltsin. Where Yeltsin brought disorder, Putin brings order. Where Yeltsin allowed the Americans to walk all over Russia, Putin stops them. That’s his brand. I don’t trust Mr. Putin. Not only did Bush enlarge NATO, but he then started putting military installations in Eastern European countries, negotiating the construction of a missile base in Poland. Talks about bases in the east began in 2002, and formal negotiation began in 2007. We all remember how upset we were when the Soviet Union put missiles in Cuba. The Russians were horrified by the Polish plan. Putin–suspicious of us to begin with because our behaviour in the 90s–took Bush’s behaviour badly. He decided to draw a line in the sand–those countries which remained in the Russian sphere of influence would stay in that sphere, even at the cost of deploying military force. In 2008, Bush called for Georgia to begin taking steps to join NATO. Putin responded by doing everything he could to punish Georgia. Separatists in the breakaway regions of Abkhazia and South Ossetia began acting up–perhaps with Putin’s encouragement. He also began establishing formal ties between Russia and these regions, beginning to treat them as independent states. When Georgia responded by attacking the separatists, Russia responded by invading Georgia. Georgia lost the war, Russia formally recognised Abkhazia and South Ossetia as independent states, and Russian military bases were established in each of the territorial enclaves. The message from Putin was clear–further efforts to admit Georgia to NATO would result in further military intervention from Russia. At the end of Bush’s presidency, relations with Russia were a shambles. This would be the beginning of a trend. The Russian word on the button was mistranslated–instead of saying “reset”, it said “overcharged”. Like Bush, Obama wanted something from Russia, and like Bush, he was unwilling to recognise that for the Russians, everything is tied together. If we do something they don’t like in one area, they withhold cooperation in other domains. In Obama’s case, the mistake was very similar to Bush’s in Georgia–Obama began trying to admit Ukraine into the western sphere. The difference was that the move here was to associate Ukraine with the EU rather than admit it to NATO. The pro-Russian government was removed in what the Russians consider to be a US-backed coup. American public officials–like Senator John McCain–were quoted in support of the Euromaidan protests which eventually produced the collapse of Ukraine’s government. Putin believes the America did more than just express verbal encouragement–he thinks America bankrolled the whole thing. Regardless of whether and to what extent we were involved in the regime change in Ukraine, the Russians believe we were deeply involved and they were not willing to permit Ukraine to leave their sphere of influence, so they invaded Ukraine, annexed Crimea, and continue to provide support to rebels in the Eastern region of Donbass. That conflict continues to this day. We can’t deal with the Ukraine problem in an isolated fashion, since there are other interests as well. We want to keep open our lines of communication with the Russians on topics such as Syria, Islamic State, Assad or Afghanistan. Putin came to see Hillary Clinton as an existential threat to his regime, and he was likely determined to do everything he could to ensure she did not become president. It is likely that the leaking of Clinton’s emails to Wikileaks and the Russian presence on social media were motivated by this. Every American president since the collapse of the Soviet Union has tried to turn Russia into an ally on terrorism. Increasingly, American presidents also want Russia as a bulwark against the rise of China. These geostrategic interests in a good relationship with Russia haven’t changed. What has changed is the attitude of the American media, which now sees Russia as an essentially villainous state and therefore views all efforts to revive relations as potentially treasonous. Trump must, for the good of the national interest, attempt to once again get the relationship with Russia right. Usually, new presidents have support from the public and the press when they try to fix the US-Russian relationship. But Trump must attempt to do it without that support, and with sanctions from the previous administration still in force. If Trump tries to lift those sanctions, he will be painted as a traitor, and so Trump is backed into opposing the Russians even as his administration recognises the need to cooperate with them. It is in this respect that the Mueller investigation has caused the most damage to the United States–it has interfered in our ability to once again attempt to reset the Russian relationship. Without that reset, our antagonistic relationship with the Russians ensures that they drift into China’s sphere of influence, weakening the long-term geostrategic position of the United States. America’s greatest Cold War success was splitting the Sino-Soviet alliance. If we continue down our present path, that alliance maybe reconstituted, and the work of Richard Nixon undone. It’s not very likely that Trump would succeed in any case. To have a good relationship with Russia, we have to make concessions to the Russians which we have been unwilling to make. We’d need to recognise that Russia has certain core interests in its immediate neighbourhood and stop trespassing in it. At minimum, this would mean keeping countries like Ukraine, Belarus, and Georgia neutral, and perhaps even leaving them saddled with corrupt, pro-Russian governments. It might also mean tolerating Russia’s bid to restore the Assad regime in Syria. 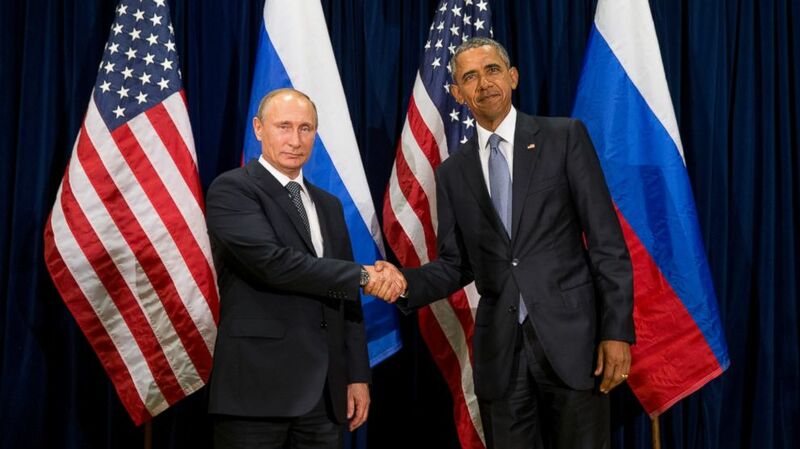 Previous American presidents have been unwilling to pay the cost of friendship with Russia. Trump would have to make big concessions–concessions which would look like a betrayal to many old foreign policy heads–to stand any chance of bringing the Russians onside. Based on the media reaction to his first meeting with Putin, Trump likely has very little room to move. China is the beneficiary.